SchoonerSail’s Tall Ships Sailing Holidays Blog. Aaland Islands Sailing, The Tall Ship Pommern And Gustaf Erikson. Sail on our schooner to the home of the last square riggers. The Relating In Notes Of Various Adventures Northerly Towards Edinburgh. A SchoonerSail sailor lives to tell the tale of three thunder and lightening storms in one week. What’s it like sailing offshore on a schooner when the wind blows a bit? Watch the video and see. 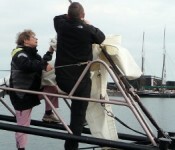 Keith, a regular sailor onboard Trinovate describes a days sailing. How to love and maintain your traditional schooner rig. Things to do in Alesund, Norway with two walking maps. Force 7 gusts and 3m waves were countered by a pristine view of the Milky Way and shooting stars. Sailing from Stavanger to Krisitansand – a blog post from the crew of the schooner Trinovante. Extreme chill out sailing holiday. Experiences from a tall ships adventure holiday. Marcel and Julie found an adventure sailing holiday on a traditional schooner online – here’s how they got on. Sea Fever or If William McGonagall had sailed on the schooner Trinovante he might have written. John and his family found Trinovante online when looking for a tall ship sailing holiday and decided to try something different this year. Three crew with varying levels of experience share their view points.